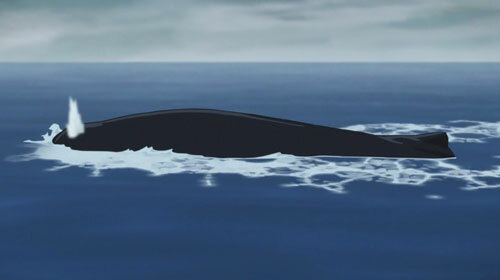 It is a spearm whale (Physeter macrocephalus), what is strange. First of all, you need a big luck to meet a spearm whale in a Sea of Japan, because it is too shallow and innutritious for these animals. 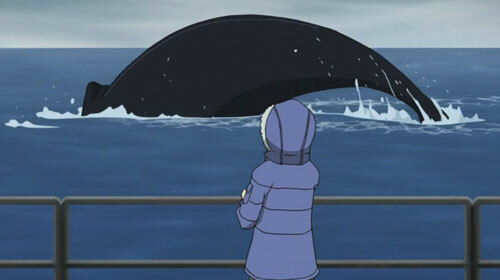 Secondly, spearm whales are not the dolphins, they do not follow a big vessels on root. They do not do it for a good reason: when they dive, they descend abruptly to a depth of 1 km, where they hunt for cephalopods up to an hour. After this kind of exercises average whale just lay on a surface and breath. One can even pat its side at the moment (it is highly unrecommended of cause. Though they are not aggressive, they still can accidentally overthrow the boat on dive). While resting, spearm whale cannot only overtake the BATM, it can`t even evade the incoming vessels, so that cases of a collision with spearm whales is not quite rare. Это кашалот (Physeter macrocephalus), что довольно необычно. Во-первых, кашалот в Японском море – явление весьма редкое. Во-вторых, кажется странным, что кашалот идёт, как дельфин, в кильватерной струе «рыболова». Дело в том, при погружении кашалоты сразу же погружаются на глубину 200 м и долго охотятся на километровых глубинах. Поэтому, когда всплывают, десять минут просто лежат на одном месте и дышат. В это время по кашалоту можно спокойно ходить. И в таком состоянии он не то что не может догнать БАТМ – он даже не способен уклониться от идущего ему в лоб судна. 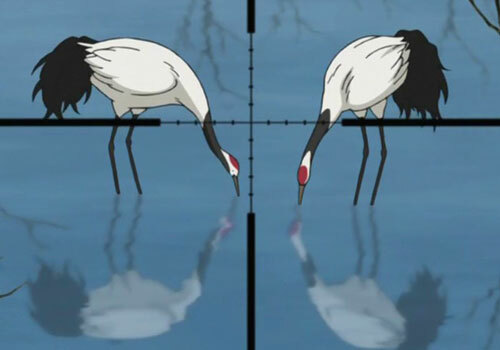 The birds that Suo used as an aim in her firing practice are the Japanese cranes (Grus Japonensis). The range of these birds includes several grounds of Eastern Asia (in Korea, China, Far East of Russia), Kuril Archipelago (Russia) and Hokkaido Island (Japan). Currently the species is at risk of a total extinction, these cranes are enlisted as "Endangered" under the IUCN Red List. They numbers only about 1500 individuals to date. Птицы, по которым стреляла Суо, это японские журавли (Grus Japonensis). Обитают на Дальнем Востоке, Курильских островах и в Японии (о. Хоккайдо). Находятся под угрозой полного исчезновения, охраняются международным и национальными законодательствами, занесены в Красную книгу. Их осталось около 1500 особей. 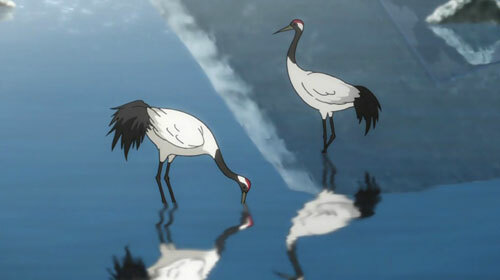 Since Suo was studying in Vladivostok and her father was a hunter, she should know about these birds. It is one of the largest cranes (158 cm tall, with typical weight being about 7.5 kg). The distinctive feature of this species is a dazzling white coloration of its plumage (including covert feathers of wings) with a patch of red skin on its head. It is hard to believe that these birds can live so close to humans, and especially next to construction site. Japanese cranes are very timid by its nature, they nests only in a highly remote and inaccessible areas. Usually when they see humans as far as 1-2 km to those nesting areas, they abandon it. Поскольку Суо училась во Владивостоке, а её отец был охотником, она должна была знать об этих птицах: это один из самых крупных журавлей (рост около 158 см, а вес 7.5 кг), отличие от других видов – ярко-белый цвет большей части оперения, включая кроющие перья крыльев. Трудно поверить, что эти птицы обитают так близко к цивилизации, а ещё и рядом со стройкой. Японские журавли очень пугливые, вьют гнезда в максимально недоступных местах, а если видят человека за километр-два от своего гнездовья, обычно улетают оттуда навсегда.